A member of Red Sox nation apparently doesn’t like the taste of his own medicine. Thought: Must’ve been Red Sox fans. “So what does Sciesinski have to say for himself? That he was tired of being hassled by security and the home crowd. 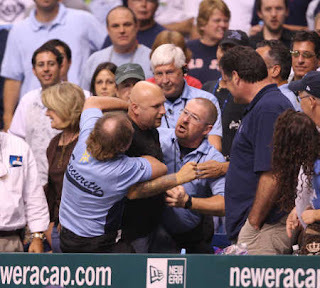 Sciesinski said he was ‘striking back for Red Sox nation’ for all the ‘hatred’ from Rays fans. But all is not cool. Sciesinski is accused of drunkenly cursing Rays fans and was arrested on a misdemeanor charge of disorderly conduct. After experiencing Camden Yards when the Red Sox visit town, it’s hard to feel sorry for the guy. I so agree. It is hard to muster any compassion for them. As much as I consider myself a hippie and peace activist, they can set me off my course. I’d rather hang out with Saddam Hussein.